In an exclusive interview with Meet the Press, President Barack Obama tells David Gregory he's optimistic the fiscal cliff can be averted, lays out the goals for his second term, and also discusses the Benghazi attack and how it was handled by the administration and those on Capitol Hill. Updated at 1:30 p.m. ET: President Barack Obama on Sunday said congressional Republicans and their insistence on preventing tax increases for the very wealthy are standing in the way of a deal to avoid the so-called fiscal cliff. In an exclusive interview on NBC's "Meet the Press," the president chided House Republicans as the clock continued to run out on a potential agreement. "They say that their biggest priority is making sure that we deal with the deficit in a serious way, but the way they're behaving is that their only priority is making sure that tax breaks for the wealthiest Americans are protected," Obama said. "That seems to be their only overriding, unifying theme." President Barack Obama says he negotiated with House Speaker Boehner in good faith and moved more than halfway in order to achieve a grand bargain. House Speaker John Boehner issued a statement shortly after Obama's interview was broadcast accusing the president of backpedaling on "needed cuts and reforms" that he had previously agreed upon. With a little more than one day remaining before the nation faces automatic spending cuts and tax hikes that could impact an already-wobbling American economy, the president implied that there has been little progress in recent days to justify hopes of a last-minute deal to prevent going over the fiscal cliff at year's end. "I was modestly optimistic yesterday, but we don't yet see an agreement," he said in the interview, taped on Saturday at the White House. "And now the pressure's on Congress to produce." The president appeared open to eliminating at least some of the scheduled automatic spending cuts if Republicans agree to tax increases for the wealthy. Those cuts are slated to impact defense spending and non-entitlement discretionary spending beginning on Jan. 1. "If we have raised some revenue by the wealthy paying a little bit more, that would be sufficient to turn off what's called the sequester, these automatic spending cuts, and that also would have a better outcome for our economy long-term," he said. The president challenged Republicans to vote on legislation that he said should be introduced by the Democrat-controlled Senate to prevent taxes on the "middle class" from being increased. But he did not specify what income level he would be willing to accept as a dividing line between those who retain Bush-era tax rates and those whose rates would increase. The president has consistently supported increasing taxes on families making over $250,000 a year, but that figure has been a major bargaining chip in negotiations. Wherever the line on tax increases ends up, Obama urged a vote in both houses on a final Senate bill if a broader agreement cannot be reached. 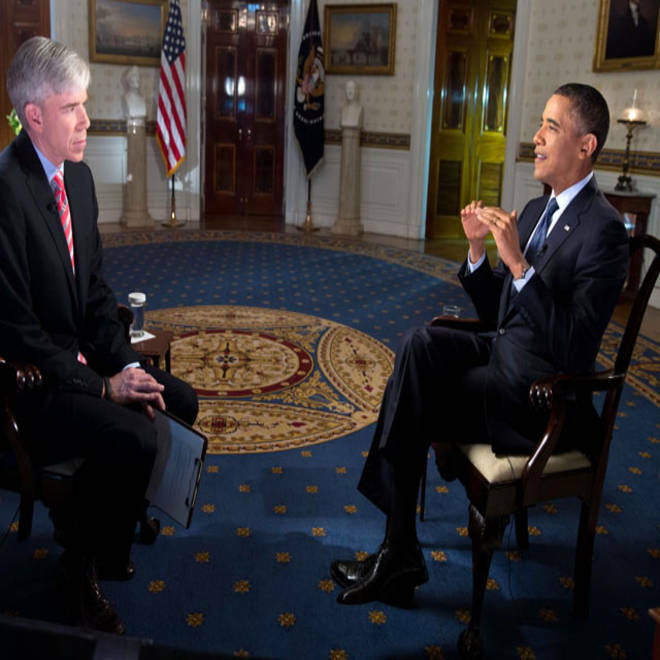 President Barack Obama is interviewed by David Gregory of NBC's "Meet The Press" in the Blue Room of the White House, Dec. 29, 2012. "Everybody should have a right to vote on that," he said. "If Republicans don't like it, they can vote no. But I actually think that there's a majority support for making sure that middle class families are held harmless." "So far, at least, Congress has not been able to get this stuff done," he added. "Not because Democrats in Congress don't want to go ahead and cooperate, but because I think it's been very hard for Speaker Boehner and Republican Leader McConnell to accept the fact that taxes on the wealthiest Americans should go up a little bit, as part of an overall deficit reduction package." Dismissing the notion that the Democratic Party is as compromise-averse as the GOP, the president said Democrats -- "warts and all" -- have more consistently agreed to components of bipartisan deals. "What I'm arguing for are maintaining tax cuts for 98 percent of Americans. I don't think anybody would consider that some liberal left-wing agenda. That used to be considered a pretty mainstream Republican agenda," he said. "And it's something that we can accomplish today if we simply allow for a vote in the Senate and in the House to get it done. The fact that it's not happening is an indication of how far certain factions inside the Republican Party have gone where they can't even accept what used to be considered centrist, mainstream positions on these issues." The president offered no new suggestions of compromise measures that may be more palatable to Republicans, although he acknowledged that some Democrats oppose entitlement adjustments and some of the spending cuts that he's put forward during negotiations. The president games out different scenarios of how he thinks the fiscal cliff negotiations will be resolved. "The offers that I've made to [Republicans] have been so fair that a lot of Democrats get mad at me," he said, noting that his acceptance of Chained CPI, a measure that would change the way Social Security payments are determined, has caused particular rancor within his own party. "Highly unpopular among Democrats," he said of the proposed change. "Not something supported by AARP. But in pursuit of strengthening Social Security for the long-term I'm willing to make those decisions." If an impasse remains in place, Obama warned, Republicans' rejection of his version of deficit reduction plans would be enough to send financial markets skidding. "What's been holding us back is the dysfunction here in Washington," he said. "And if people start seeing that on January 1st this problem still hasn't been solved, that we haven't seen the kind of deficit reduction that we could have had had the Republicans been willing to take the deal that I gave them, if they say that people's taxes have gone up, which means consumer spending is going to be depressed, then obviously that's going to have an adverse reaction in the markets." In his statement, Boehner, R-Ohio, called Obama's comments "ironic," saying that "a recurring theme of our negotiations was his unwillingness to agree to anything that would require him to stand up to his own party. Needed cuts and reforms that the president agreed to just last year were no longer on the table, as he cited an inability to sell them to Democrats. "In an effort to get the president to agree to cut spending -- which is the problem -- I put revenues on the table last year, and I put them on the table again last month. Republicans made every effort to reach the 'balanced' deficit agreement that the president promised the American people, while the president has continued to insist on a package skewed dramatically in favor of higher taxes that would destroy jobs. We've been reasonable and responsible. The president is the one who has never been able to get to 'yes.'" NBC News' Frank Thorp contributed to this report.